Tony enlisted in the Army at Fort Jackson, South Carolina at the young age. After completing his Basic Training he was shipped off to Vietnam and completed three consecutive tours. In 1972 when he returned he was assigned to Fort Sill, Oklahoma. Where he purchased a 1957 Chevy Sedan delivery (Mail Delivery car), began racing every weekend on the Oklahoma and Texas Drag Strips, placed in the Super Stock/ p Automatic Class in the National Hot Rod Association (NHRA) and there is where his passion and career for fast street cars was born. In 1973, a year later, he was transferred to Fort Stewart, Georgia for five years. Then was transferred to Hunter Anny Airfield where Rodell Johnson and Tony built a Drag Racing Super Stock F Automatic Class 1971 Chevell called the “Toy Soldier”. He set up a Drag Racing Club called the Fort Stewart “Hot Rudders” using an old abandoned air field to race on at Fort Stewart Ga.
Johnson then joined the Harold’ s Drag Racing Association (HDRA) in Germany and through the year’s Fought many battles using the “‘Toy Soldier” and the Corvette called (Passport) against their biggest opponent Willy Histamine driving a Competition Eliminator Altered car called the “”Mafia Mouse”. Thus, Tony was nicknamed the GOD Father of Drag Racing. While realizing there was a demand and to keep young kid drivers from dangerously racing on the streets and the German Autobahn he founded the Operation Street Legal Drag Racing Program. He gained support from Carl Olsen, advertising and sales manager of the National Hot Rod Association (NHRA) for the soldiers that were stationed in Germany. Tony even had the Frank Hawley Drag racing School to come to Germany from the states. And Frank Hawley came over personally to teach 18 new drivers and certified them with (NHRA) Competition License. Although, Tony does not speak any German he found someone that could translate his ideas to the Local German Government named MAJ Melvin Jones. Currently, he is still working as a Colonel assigned in Germany awaiting Tony’s return from Afghanistan to continue the Program with a new members of the Staff who is base in Las Vegas they will be working with G-Man as well with European Drag Racing Series (EDRS). Operation Street Legal Program. He simply moved it to the Netherlands, found a new Team mate Cary Koper, & Don Leemker who he named the President of the (OSL) program, along with John Frijn. While continuing to support from afar. From the beginning the plan was to setup an (EDRS) European Drag Racing Series and there were many ups and downs with the learning curve. gateway into the NHRA. Tony Rowe Enterprises (TRE) and his Staff out of Las Vegas wards the driver with the highest points from the season all kinds of gifts and prizes to include two free tickets to the Las Vegas Drag Races National or the Pomona Finals and SEMA Show all expenses paid (except food) and the same highest point driver get to go 10 the Frank Hawley Drag Racing school for NHRA Certification. He will continue to be our God Father of Drag Racing in Europe with European Drag Racing Series and Operation Street Legal Drag Racing Programs to keep the kids on the Drag Strip not the Streets! Tony has put his trust in G-Man the Leader in EDRS / Operation Street Legal Program anyone needing to contact Tony can go through the web site and he will contact or respond. Tony will come back as soon as he is released from his current obligation in Afghanistan. In 20 12 he is hoping EDRS in the Netherland will partnerships up with Germany. 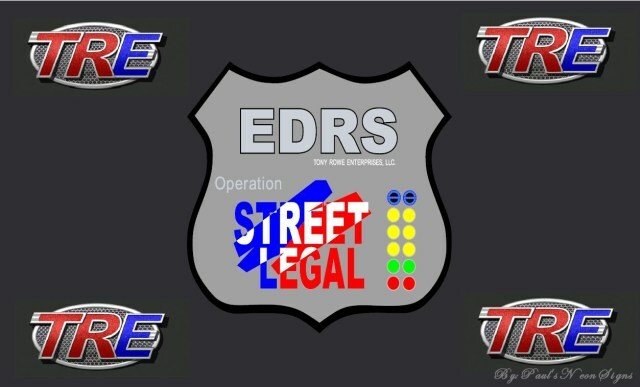 To unite all street legal organisations in Europe under one flag DHRA & TRE making EDRS/Operation Street Legal Drag Racing a European sport for years and years to come.